I've found that when you start to feel old, the trick is to hang around people or things that are older than you. 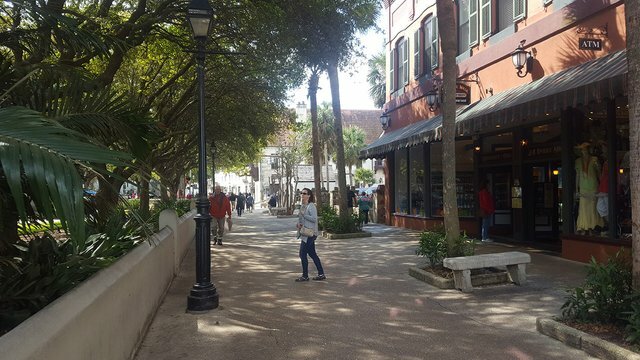 St. Augustine, FL, for instance, is the oldest city in the United States, and thus older than me. 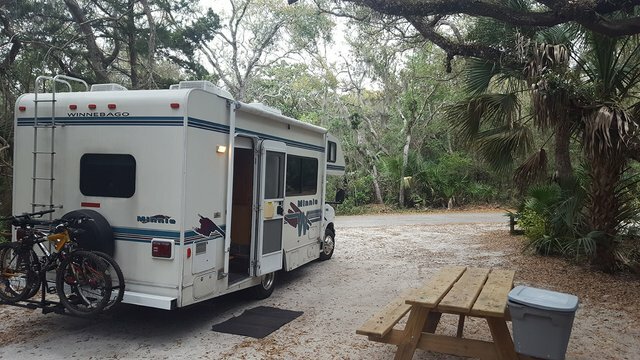 This past weekend, in the middle of March (which also is South Florida's spring break period), we managed to snag a one-day campsite at the hard-to-get-into Anastasia State Park. 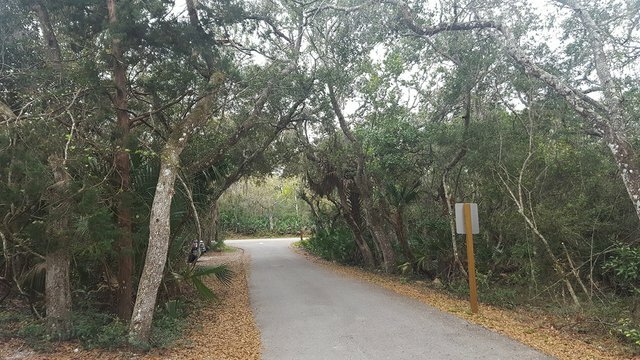 It's a big, beautiful park right on the ocean and also a short drive away from the old historic parts of St. Augustine itself. Since we had the Landwhale, we stayed overnight (Sunday night) in the park and then explored St. Augustine a bit on Monday. While the temperature was bracing and the skies bleak, at least we didn't get any rain. Excellent clean campsite. Far too large for our tiny RV, but we had plenty of room for activities. Looking both ways before we cross the street. The road past our campsite is quiet and nicely overgrown. 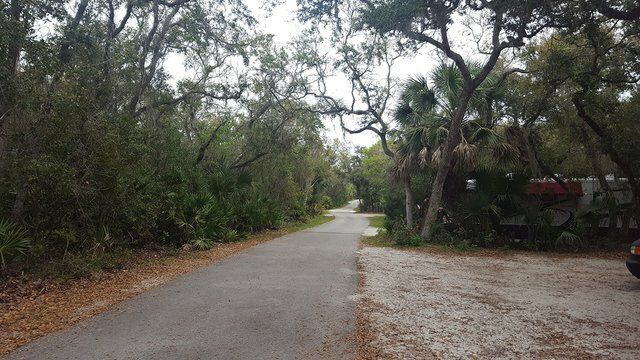 Lots of campsite loops in the park overall, but they're all a short walk (or bike ride) to the beach. We biked down for a quick peek. 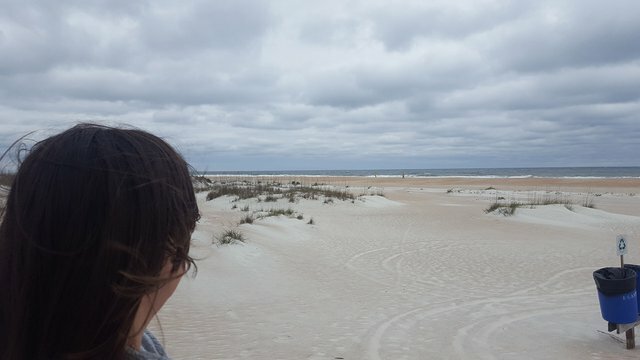 It has a very Cape Cod feel, with lots of sand dunes and wide expanses of open flat area. Very windy and not exactly sun tan weather. 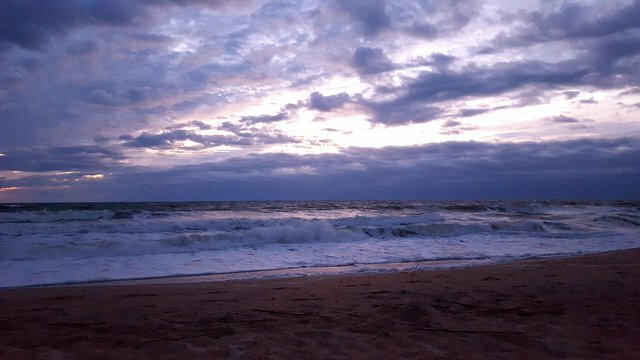 We always try to get in a beach sunrise, so we came back out the next morning at 6:30am. Very cold, very brisk. Lots of blankets shared. 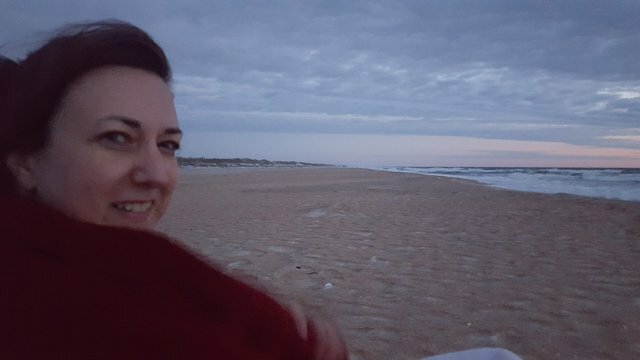 The wife's face is frozen like this in the photo; I don't think she was trying to smile. The wind makes for some aggressive waves, and some fun blobs of sea foam that scooted across the sand until they disintegrated. 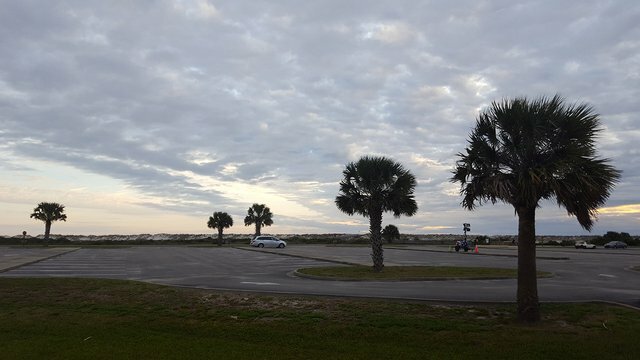 Parking lot for the beach. Nobody wanted to join us this morning, I guess. here is a sneak preview of my wife looking at some plants in the historic downtown area. 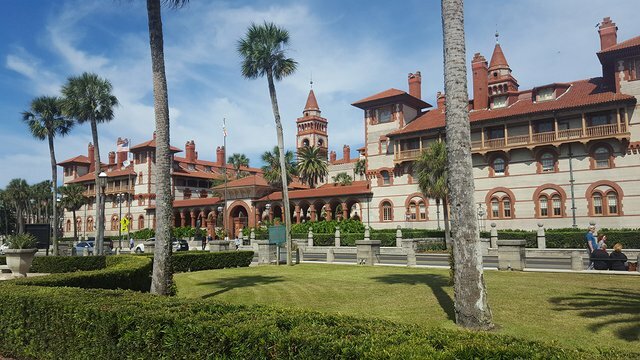 And the amazing Flagler College building. I'm happy our day in St. Augustine itself was at least under a blue sky, but the winds were still very active and I lost my hat more than once. Looks like an extremely beautiful and charming place. Funny. Up here in Canada, I got a little sun yesterday on my face. It has been a long, cold winter and so it was much appreciated, Bring on the vitamin D synth. Augustine is so pretty; will have to put it on my list of places to see. People don't realize the value of the sun until it goes away :) Usually no lack of sun and vitamin D down here in FL. You've crossed my mind several times lately, and so I'm dropping in to say "Hey." Are you writing your book? What's new?